Thanks to Dr. Linh Dang, Baylor College of Medicine, Texas (USA) for contributing this case. To contribute a Case of the Week, follow the guidelines on our Case of the Week page. (1) We have extensively updated the CD Markers CD1-CD49 chapter, which now has 68 topics, 479 images and 1092 references. (2) For a "printer friendly page" of any part of our website, we recommend visiting http://www.printfriendly.com, which has options to print with or without images. As this works better than our "printer friendly" versions of chapters, we will remove the printer friendly versions as we update chapters. (3) We invite you to join our new PathologyOutlines.com LinkedIn group. To join, you must join LinkedIn (which is free). The purpose of this group is to provide useful professional information to practicing pathologists and laboratory personnel. We invite pathologists and laboratory professionals to share thoughts, ideas and discuss issues related to pathology. This forum is an opportunity to keep up to date with the latest clinical developments and discuss challenges with like-minded colleagues. Just visit http://www.linkedin.com, and search for PathologyOutlines.com in the Groups section. A 12 day old premature male infant was delivered with a ruptured omphalocele and congenital heart defects. On autopsy, bilateral milky-white pleural effusions were present. There was 6 ml of fluid on the right and 13 ml on the left. A chemical analysis of the pleural fluid showed 1512 mg/dL of triglycerides, 120 mg/dL of glucose, 125 mmol/L of sodium and 0.5 g/dL of protein. Primary (congenital) pulmonary lymphangiectasis is a rare disease characterized by abnormal dilatation of pulmonary lymphatics, but without lymphatic proliferation (J Korean Med Sci 2007;22:740). Pulmonary lymphangiectasia was classified by Noonan in 1970 into three groups (Am J Dis Child 1970;120:314). Group 1 was generalized lymphangiectasis, including lymphedema with intestinal lymphangiectasis. Group 2 was a secondary disorder due to pulmonary venous hypertension or obstruction associated with cardiovascular anomalies. 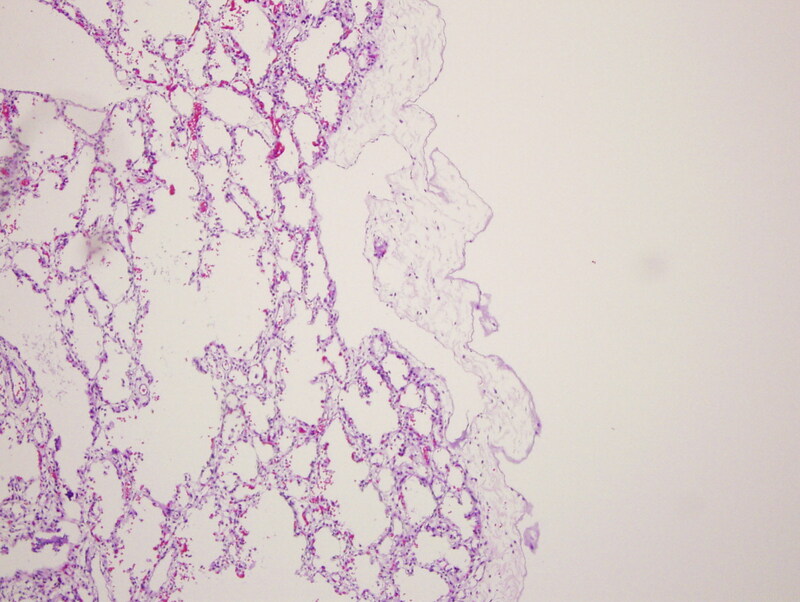 Group 3 included patients compromised by a primary developmental defect of the pulmonary lymphatics. In 2000, Faul proposed classifying these disorders as primary or secondary lymphangiectasis (Am J Respir Crit Care Med 2000;161:1037). Primary cases present in neonates with severe respitatory distress with pleural effusion, with generalized edema in some cases. Patients usually require mechanical ventilation. Historically, they were almost always fatal. They are thought to be caused by a failure of pulmonary interstitial connective tissues to regress, leading to the dilation of pulmonary lymphatic capillaries. Secondary cases are due to various disorders that impair lymphatic drainage and increase lymph production, including surgery, radiation, infection, tumor or trauma. Grossly, the lungs of pulmonary lymphangiectasis are heavy and noncompliant, with numerous dilated lymphatics or cystic spaces in the visceral pleura. 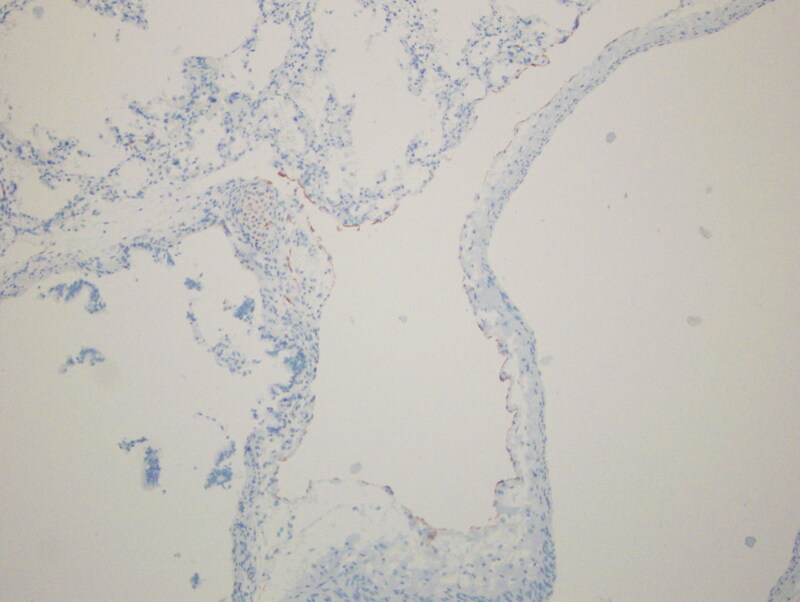 Histology shows widened interlobular septa, and dilated / cystic lymphatic vessels that stain for D2-40. 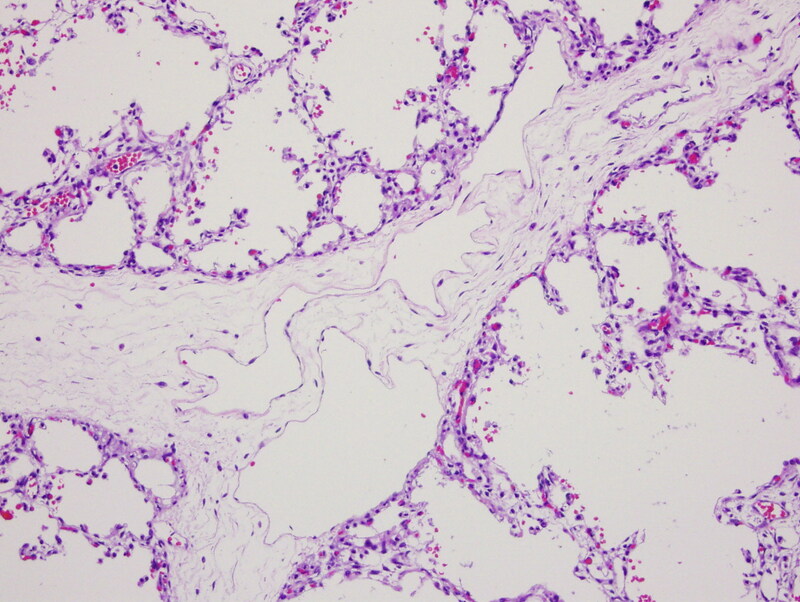 - Pulmonary interstitial emphysema: cystic spaces are connected with alveoli, and keratin staining shows pneumocytes lining the intact alveolar walls. - Congenital cystic adenomatoid malformation: the entire lung is abormally arranged and immature, and cysts are lined by prominent epithelium with goblet cells. - Lymphangiomatosis: an increased number of complex, anastomosing lymphatic channels are present, and dilation is secondary, not primary. 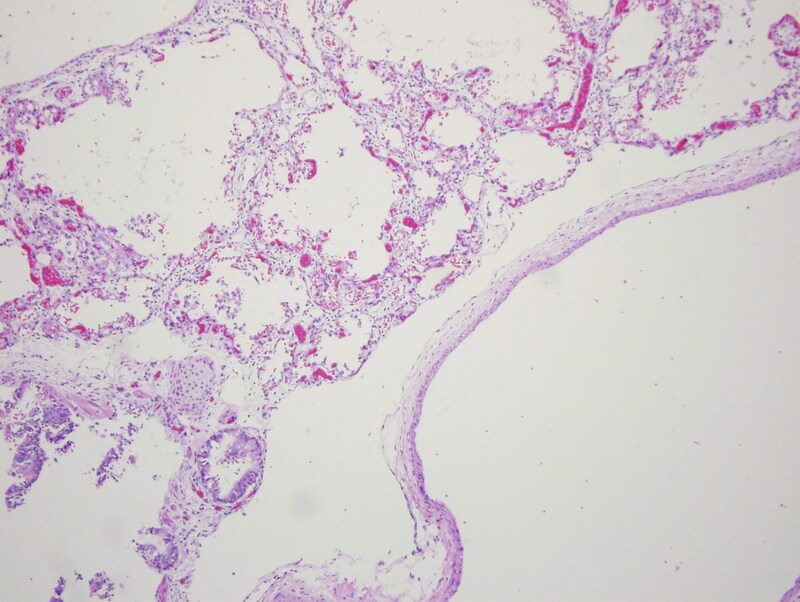 As in this case, primary pulmonary lymphangiectasis is often fatal in early life. Some authors report a better prognosis more recently due to aggressive neonatal therapies (Eur Respir J 2004;24:413), although in this study, 6 of their 9 cases had an apparently normal neonatal period, suggesting that they were actually secondary disease under the Faul classification.